bepress Legal Repository - A network of law-related research materials. Law schools, research units, institutes, centers, think tanks, conferences, and other subject-appropriate groups post materials to specific publications (e.g., the USC Working Paper Series). This content may be downloaded freely. Bluebook Abbreviations of Law Review Titles - Periodical titles and their abbreviations. Hebrew University of Jerusalem Faculty of Law Library - Electronic journals providing full text availability. 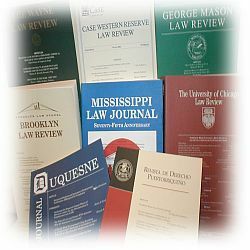 Law Journals and Publications - Index to over 120 law review titles provided by the Internet Legal Resource Guide (ILRG). Law Journals, Newsletters and Bulletins - Listing provided by Hieros Gamos. Law Reviews - Listing provided by JURIST. Legal Blawgs - Law Library of Congress web archive of more than 100 blawgs. Mealy Publications - Litigation resources and news. All of Mealey's titles are available. You will have immediate access to current issues the day they are published as well as an editorial archive of all titles from 1990. Westlaw Database Directory - Law reviews, bar journals, and legal periodicals. This webpage last updated on Tuesday, October 11, 2016 4:12 PM.